These past few days, the Casey Trees planting crew has been hard at work. 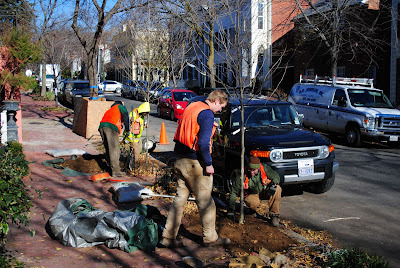 As the tree planting season wanes, our staff replanted street trees in Georgetown. 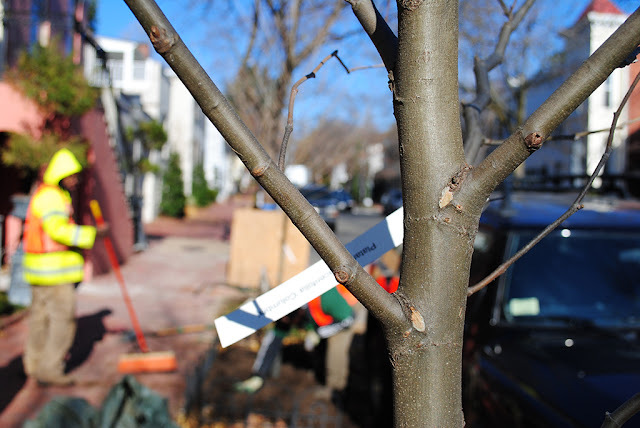 The planting locations, selected by the Urban Forestry Administration and Trees for Georgetown, include tree boxes that are empty or have dead trees or stumps, as well as stretches of sidewalk that can accommodate new tree boxes. On Monday, Tuesday and Wednesday this week, we planted 33 trees (London plane, Chinese elm, river birch, sweetgum and purple robe black locust) in our first of two major plantings. A second planting of 21 oaks will take place in March. 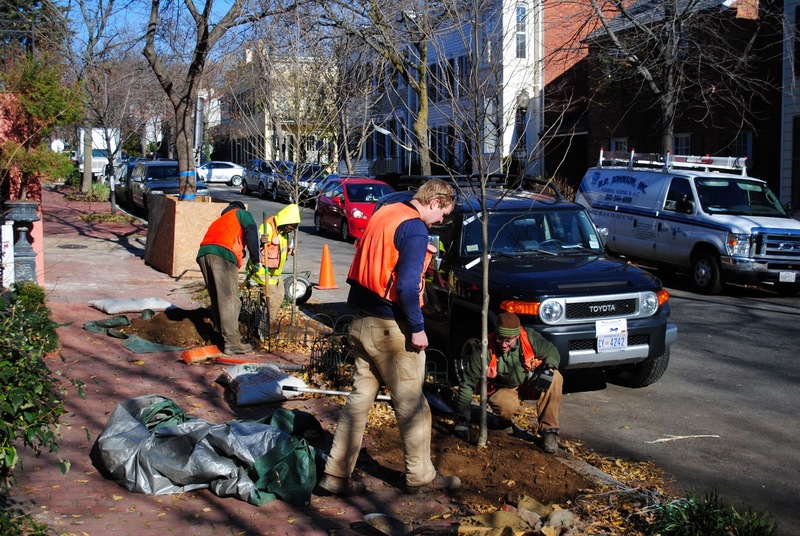 Our partner Trees for Georgetown donated a portion of its fundraising efforts to offset our tree purchase and labor costs for this project, as well as providing custom-made, wrought iron protective fences for the newly planted tree boxes. Casey Trees will be taking care of watering with the High School Summer Crew this summer and pruning will take place following the second year. We are excited to be part of the effort to re-tree Georgetown, and we are looking forward to planting more in the spring! 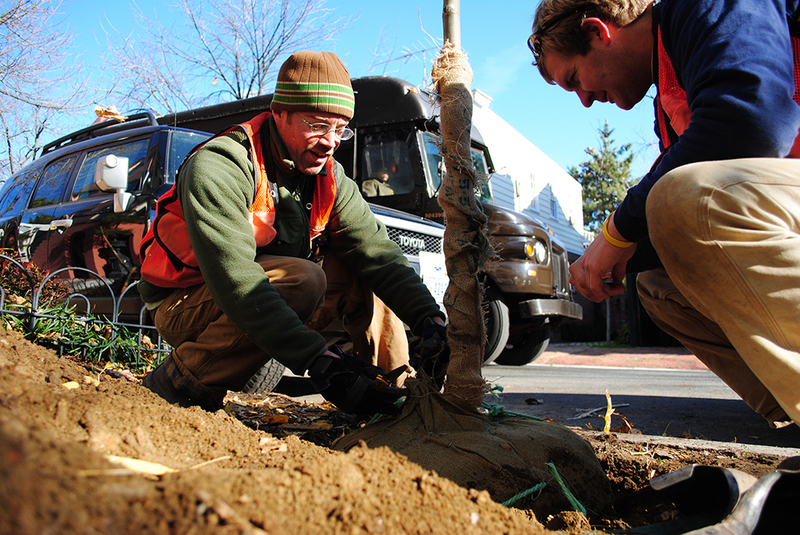 This Tuesday, newly planted London plane trees joined the Georgetown streetscape west of Wisconsin Avenue.